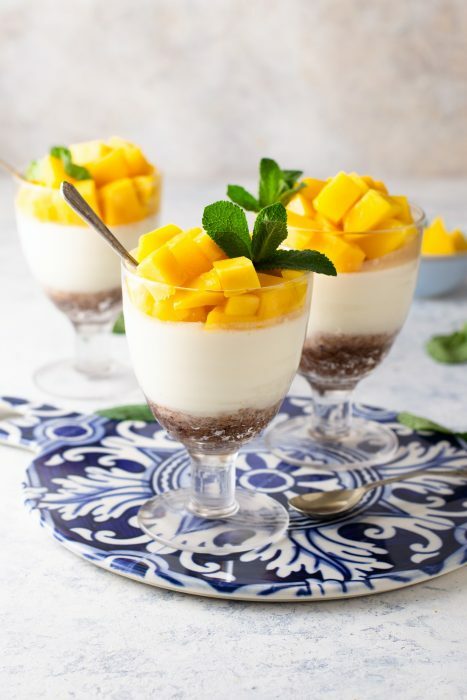 This cool, creamy mango coconut panna cotta is topped with sun-drenched mango and features a base of sweet dates and walnuts. Easy to make and lightened up with Greek yogurt rather than rich cream, it makes an elegant dessert that’s a perfect finish for a special occasion or springtime meal. Over the past few months I’ve been lucky enough to spend quite a bit of time exploring southern Italy. One of the classic Italian dishes I’ve enjoyed is panna cotta (Italian for “cooked cream”), a popular moulded and chilled dessert served plain or topped with seasonal fruits, caramel sauce or liqueur. 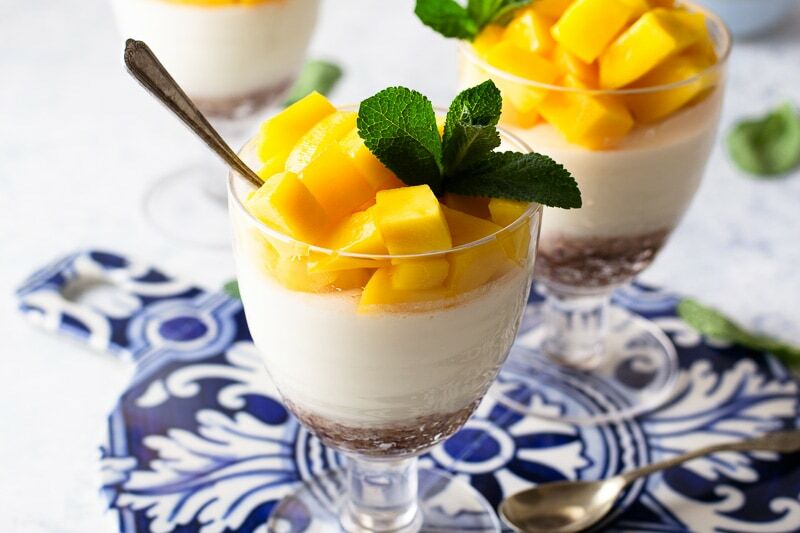 Mango season is an ideal time to make a tropical version of this delicious dessert. 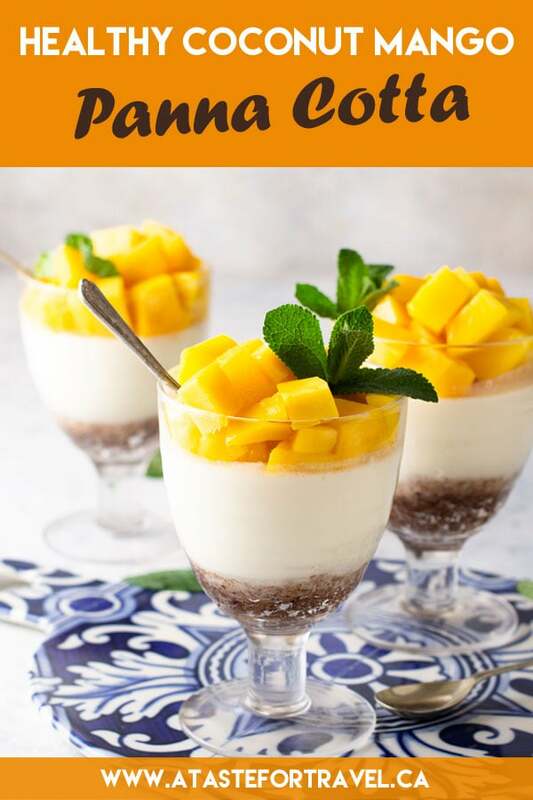 For this version of mango panna cotta, I’ve lightened up the traditional recipe for vanilla panna cotta by using Greek yogurt, milk and light coconut milk rather than heavy cream. I’ve also added sweet Medjool dates and walnuts to create a crunchy base, but for an even easier option you can omit the base and serve the panna cotta plain and topped with mangos. Although panna cotta and crème caramel look similar, they are quite different. Unlike crème caramel (known as flan in Mexico and other countries in Latin America), panna cotta does not contain eggs. Crème caramel, bathed with liquid caramel, and crème brulée, with its crackly topping of caramel, are both made with an egg custard while panna cotta is made with heavy cream. There’s another important difference between panna cotta and custard. Unlike cooked custards such as crème caramel and crème brulée, panna cotta doesn’t need to be cooked in a bain-marie or in the oven in a water bath. It’s made by dissolving gelatin in warm milk and chilling rather than cooking. This makes panna cotta much easier to prepare and especially appealing as a spring or summer dessert when you don’t want to turn on the oven. 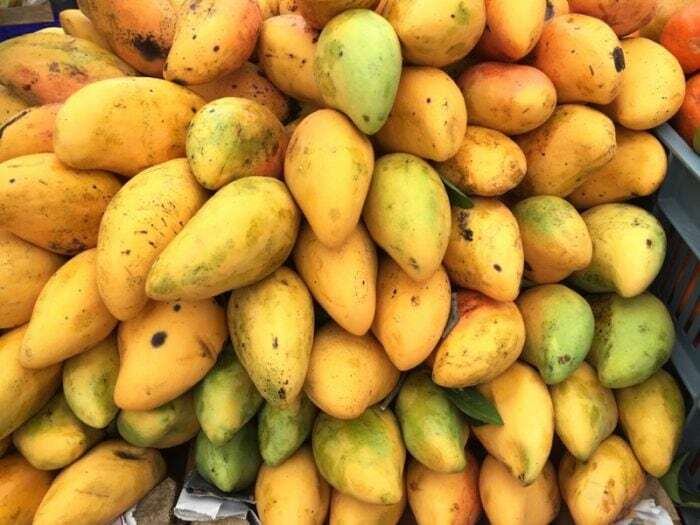 Begin by selecting ripe mangos. 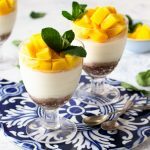 In my recipe for No-Bake Mango Pie, I discuss the various varieties of mangos available throughout the world. I haven’t yet met a variety of mango I don’t love — in my opinion they’re all delicious – but the best mangos to use for this recipe are the ataulfo variety. They’re sweet, yet firm enough to hold their shape and look beautiful without going mushy. Another key ingredient is a white balsamic vinegar. When choosing a balsamic vinegar, use a high quality balsamic vinegar from Modena, Italy, one without artificial additives. How much money do you need to spend to purchase a good quality balsamic vinegar? While researching a story on balsamic vinegars for LUXE magazine, I interviewed several producers of quality balsamic vinegars and sampled a variety of white and dark balsamic vinegars, including a prized aged version that sold for $500 USD for a single bottle. I learned that while it’s possible to spend a fortune on luxury balsamic vinegar, it’s possible to find a quality balsamic vinegar for much less. For everyday use I count on the Olio Carli brands of Aged Balsamic Vinegars. They produce both a dark and a white balsamic vinegar as well as several other products such as chile-infused oils. Produced in Vignola (Emilia Romagna), their dark balsamic vinegar is aged for 12 months in select barrels (barriques) of oak, chestnut and cherry. It’s 100% natural, caramel-free and has a beautiful flavour that’s very versatile. This makes it perfect for desserts, salad dressings and roasted vegetables where you want a rich, caramel flavour and colour. White balsamic vinegar combines white wine vinegar with aromatic grape musts from varieties such as Moscato and Trebbiano grapes grown in the Modena region of Italy. While white balsamic vinegar has the intense flavour of dark balsamic vinegar, it has a more subtle fruity aroma and a soft golden colour. This makes it ideal for light-coloured desserts or dishes where you want the tangy flavour, but not the deep red colour, of dark balsamic vinegar. While you might be reluctant to add another vinegar to your pantry, the good news is that a 250 ml (8.45 ounce) jar of either white or dark Olio Carli balsamic vinegar is $9.99 USD in most shops. In my opinion, you can’t get a better balsamic vinegar for the price! Look for it in well-stocked Italian grocers such as Maselli’s Grocers on the Danforth in Toronto or buy it online on Amazon, where you can find both the Dark Olio Carli Balsamic Vinegar and the White Olio Carli Balsamic Vinegar. If you don’t have white balsamic vinegar, you can substitute champagne vinegar or dissolve a half teaspoon of sugar or honey into 1 1/2 teaspoons of regular white vinegar. Peel and chop the mangoes into bite sized pieces and mix with balsamic vinegar. Allow the mixture to marinate while you prepare the rest of the recipe. Chop the fresh mango into bite sized pieces. Chop the fresh mango into bite sized pieces. While the mangoes are marinating, prepare the base. Add the walnuts or pecans to food processor and process into a meal. Remove and set aside. Add the dates to food processor and chop into small pieces. Then add nuts back in and blend. 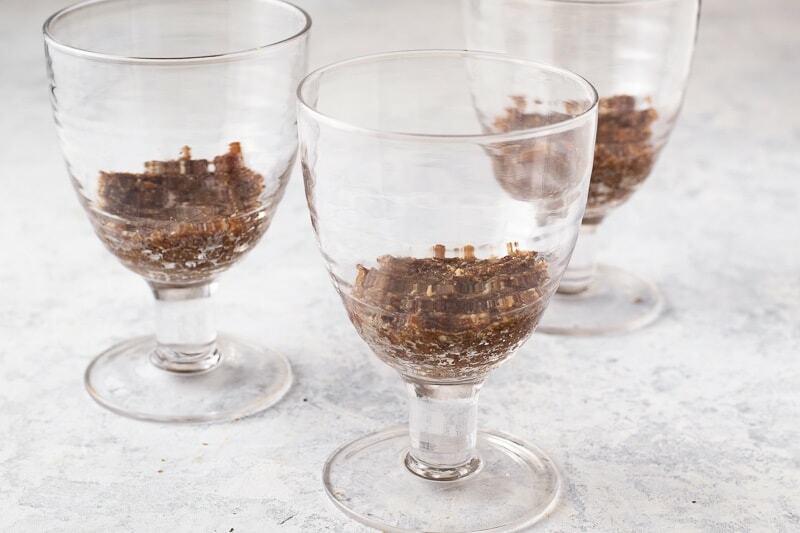 Spoon into the bottom of parfait glasses, mason jars or other clear glass serving cups. Place in the refrigerator to chill. Stir together 2 Tbsp cold water and 1 ½ tsp unflavoured gelatin in a bowl. Let stand for 5 minutes. Bring 1 cup light coconut milk, ¼ cup granulated white sugar, 3 Tablespoons unsweetened flaked coconut and ½ tsp vanilla extract to a simmer in a saucepan over a medium heat. Remove from heat. Strain. 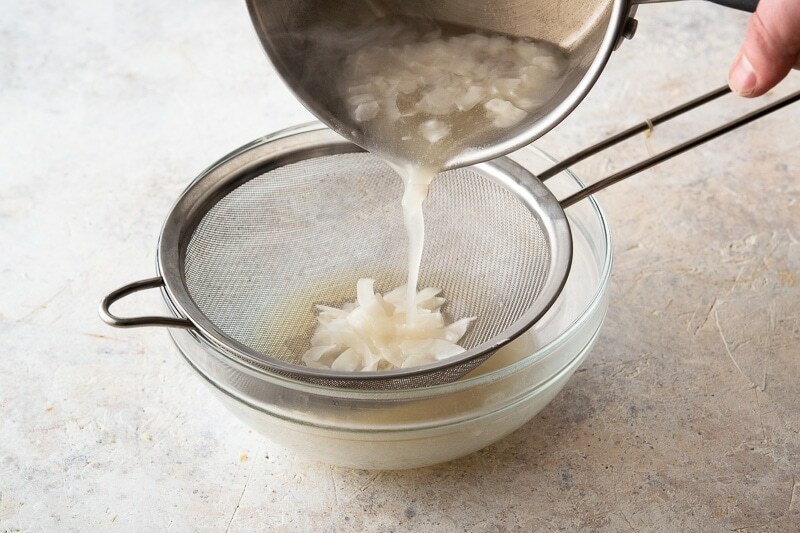 Discard the flaked coconut solids and whisk in gelatin mixture. Strain the coconut solids from the liquid. 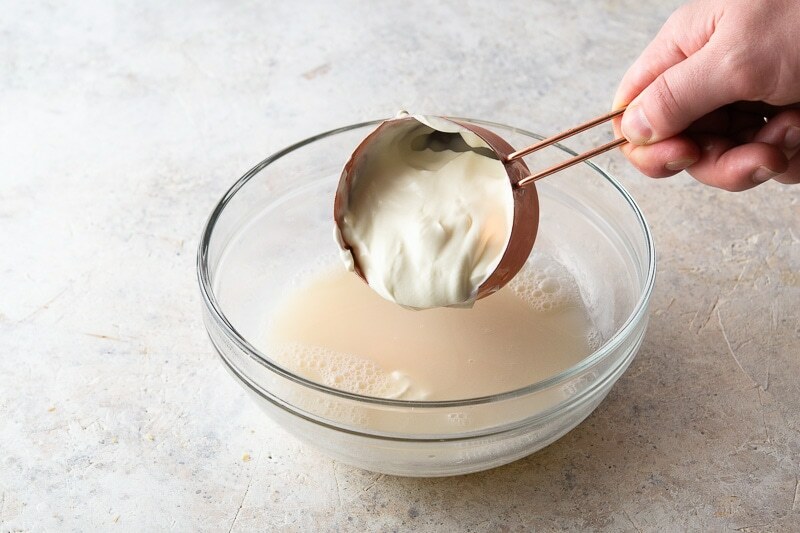 Then, add the one cup of plain 2% fat Greek yogurt and ¼ cup of whole milk to the gelatin and coconut liquid, using a whisk to mix thoroughly but gently. Assemble by dividing the filling among four dishes on top of the date base. Top the panna cotta with the mango and balsamic vinegar mixture. Assemble by pouring the coconut mixture onto the base and topping with the mango mixture. Chill for two hours and garnish with sprigs of fresh mint before serving. Vegetarians and vegans can adapt this recipe by substituting agar ( a seaweed product) for the gelatin (an animal product). Be sure to follow the directions on the package of agar agar flakes or agar agar powder as agar needs to be cooked in order for it to set. It will also be slightly firmer than gelatin. 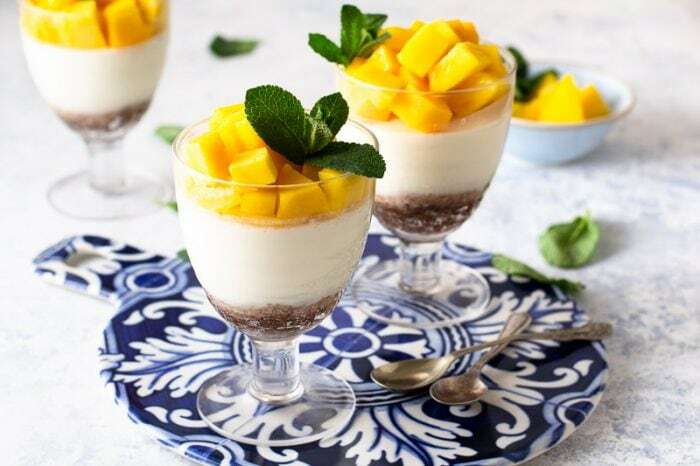 This cool, creamy mango coconut panna cotta is topped with sun-drenched mango and features a base of sweet dates and walnuts. Easy to make, and made with Greek yogurt rather than cream, it's an elegant spring dessert. 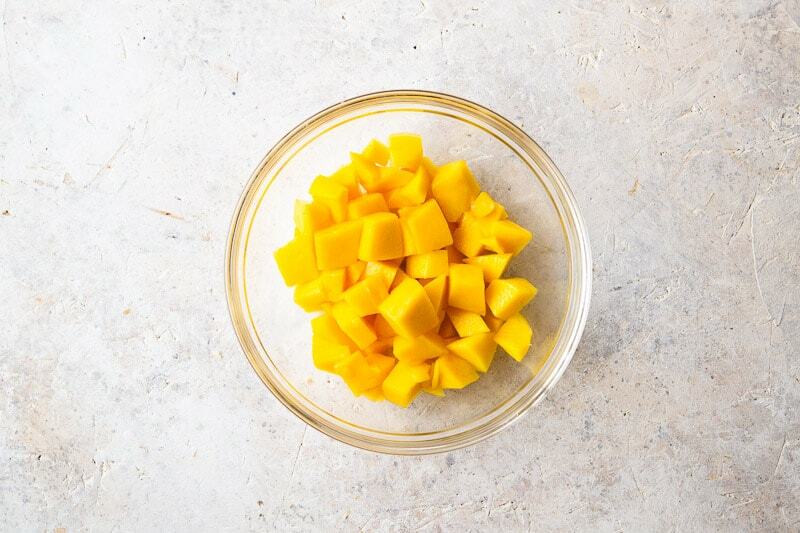 Stir together 1 cup cubed fresh mango and 1 ½ tsp white balsamic vinegar in a non-metal bowl. Chill while preparing rest of recipe. 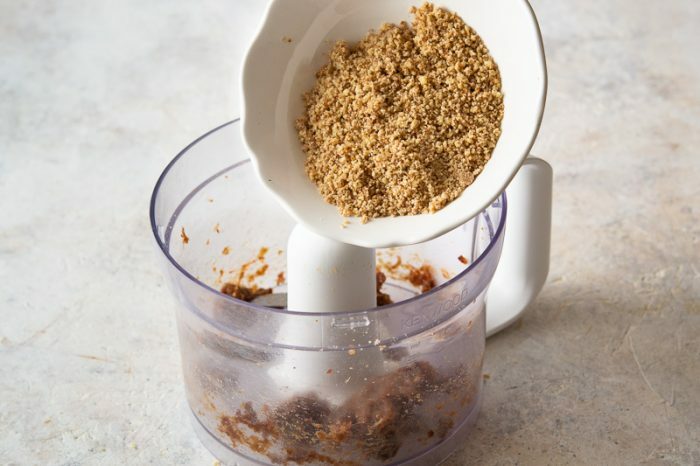 Add walnuts to food processor and process into a meal. Add dates to food processor and chop into small pieces. Then add walnuts back in and blend. Stir together cold water and unflavoured gelatin in a bowl. Let stand for 5 minutes. Bring light coconut milk, granulated white sugar, unsweetened flaked coconut and vanilla extract to a simmer in a saucepan over a medium heat. Discard solids and whisk in gelatin mixture. Add Greek yogurt and whole milk. Whisk until well blended. Divide date/nut mixture and press onto bottom layer of each of 4 parfait dishes or small mason jars. Divide filling among four dishes on top of date base. Top with balsamic mango mixture. Use fresh mango that's ripe but not mushy. For a vegetarian or vegan version, substitute agar agar for gelatin according to package directions. The panna cotta will be firmer using agar. We are really fans of panna cotta! Such an easy and tasty desserts. Love your idea of the base for this desserts – healthy and filling. And those mango cubes on top make everything so much more vibrant and delicious! Yes, mango is such a cheerful looking fruit isn’t it! This is an absolutely gorgeous panna cotta! Love the tropical coconut and mango flavors and I’m really intrigued by the white balsamic vinegar. This dessert would be perfect for Easter or Mother’s Day. Bright yellow is definitely a colour for spring isn’t it! What a lovely light and fresh Spring dish. This would be perfect for serving up at a dinner party. 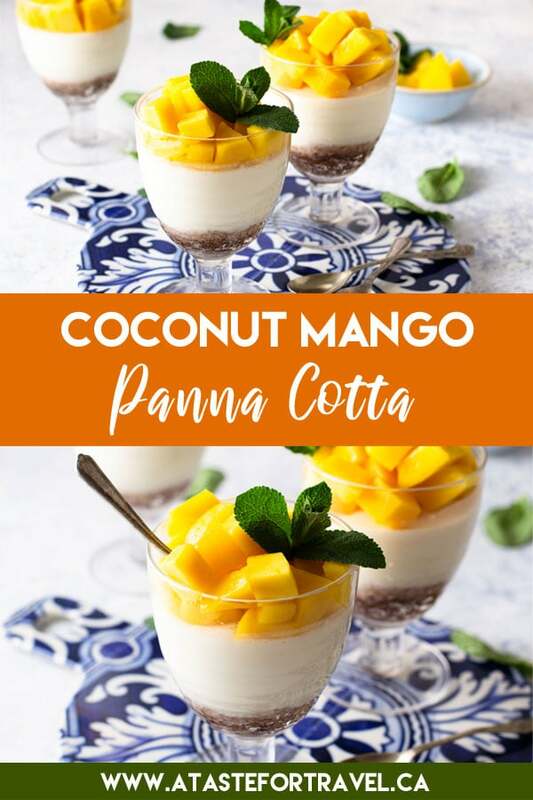 Pana cotta is my favorite dessert and the combination of tropical flavors like coconut and mango makes it an irresistible dessert. Great recipe.